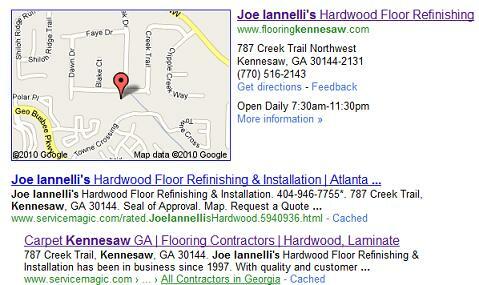 Wood floor installation and other hardwood flooring services that are done right and on time. Available in Woodstock, Marietta, Acworth, Canton, and other surrounding areas in GA.
We are a fully insured and bonded hardwood flooring service provider in areas of Woodstock, Marietta, Acworth, and Canton, GA. Our specialties include wood floor installation and other hardwood flooring services. Joe Iannelli's Hardwood Floor Refinishing offers dustless hardwood floor sanding which our clients all around Woodstock, Marietta, Acworth, and Canton, GA have preferred over the traditional wood floor sanding process that may take time to clean up. You can contact us for more information regarding the dustless system we use for floor installation and refinishing projects. Our services include an in-home consultation within areas of Woodstock, Marietta, Acworth, Canton, and surrounding areas in GA. We can discuss the kind of wood flooring that needs to be worked on and we can also provide recommendations on the type of hardwood flooring that should be used for the installation. "We will leave no wood floor before it is refinished." 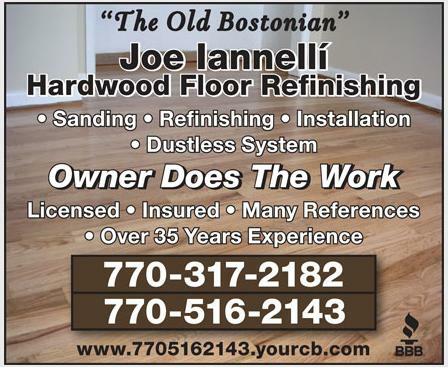 Joe Iannelli's Hardwood Floor Refinishing Contractor - Serving Marietta, Kennesaw, Cobb County, Atlanta, & surrounding areas.